The new way to snow survey could give more accurate estimates up to a month early. After five years of drought there’s so much snow in the Sierra Nevada that state water officials are preparing for a massive runoff year. But the traditional way of calculating the snowpack has a huge margin of error and as Valley Public Radio’s Ezra David Romero reports a new way to measure it could greatly decrease that inconsistency. Every winter and spring a network of snow surveyors manually tally how much snow is in the Sierra Nevada. They do this by measuring snow depth in the same spots every year. Pacific Gas and Electric Hydrographer Christine Bohrman and I hopped out of a helicopter in 2014 in the mountains east of Fresno to do this. As we snowshoed to a spot where snow levels have been recorded since 1928 she pierced the snow with a hollow aluminum tube. Snow surveys like this take place throughout the winter months in the Sierra Nevada. Christine Bohrman is detecting the depth of the snow by piercing the snow. "Now this seems pretty soft so I’m going to let it go down pretty easily,” Bohrman says. Crews like Bohrman’s either ski or fly in, but that could change with the use of new technology. A four year pilot project between NASA's Jet Propulsion Laboratory, the California Department of Water Resources and local water authorities is measuring the snowpack from the sky. They’re using planes that shoot out laser pulses to detect how deep the snowpack is and how much water is in it. It started out as a test project on the Tuolumne Watershed four years ago and is now being used on the San Joaquin River Watershed. Kat Bormann is one of the NASA scientists based in Mammoth who work on the plane. Those pulses bounce back to the unit and combined create a map of the area. The team flies the plane over the region when there’s no snow and then again at the start of each month from February to April. Subtract the first value from the second and then voila you have the snowpack depth. A second unit on the plane detects the snows density. That's called the imaging spectrometer. Thomas Painter is the NASA scientist who came up with the idea. He says to think of the old system of manual surveys like a computer screen with only a few pixels working. 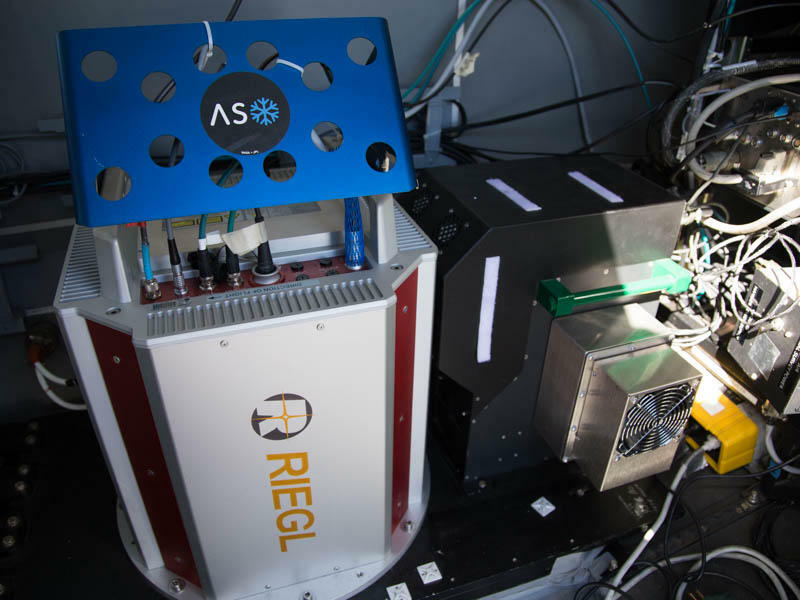 The two units in the plane are LIDAR and an image spectrometer. Painter says this is a big deal because manual snow surveys can be off by 20 to 60 percent. In his past flyovers of the Tuolumne Watershed the new measurements were only about two percent off. He says the data also shows what snow will melt first based on how dark it is. 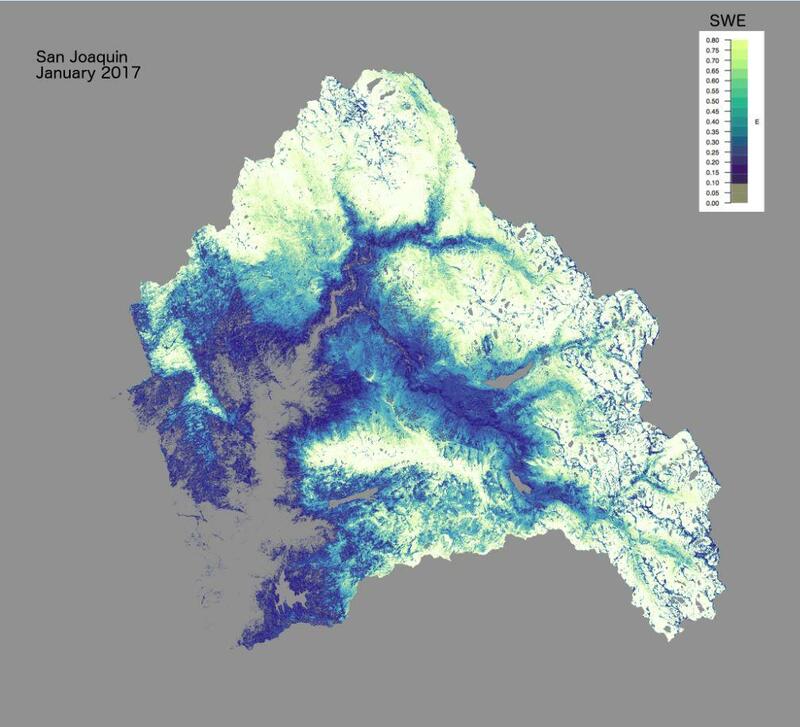 The first set of data from the flyovers of the San Joaquin Watershed from February show there’s just over a million and a half acre feet of snow waiting to melt in the mountains east of Fresno. That’s like a million and a half football fields with a foot of water covering their entirety. That number is expected to greatly increase when data comes in from the March and April flyovers. Jeff Payne is the Water Resources and Operations Coordinator for the Friant Water Authority that oversees the basin. This map represents the first flyover of the San Joaquin River Basin. If using this technology proves to be as good as it sounds Payne says its success has huge ramifications for California. Frank Gehrke leads the California Cooperative Snow Program collecting snowpack data. He says the precision that comes with using this technology may prove helpful for farms and cities in wet and dry years because they might get a water supply forecast up to a month earlier than they do now. 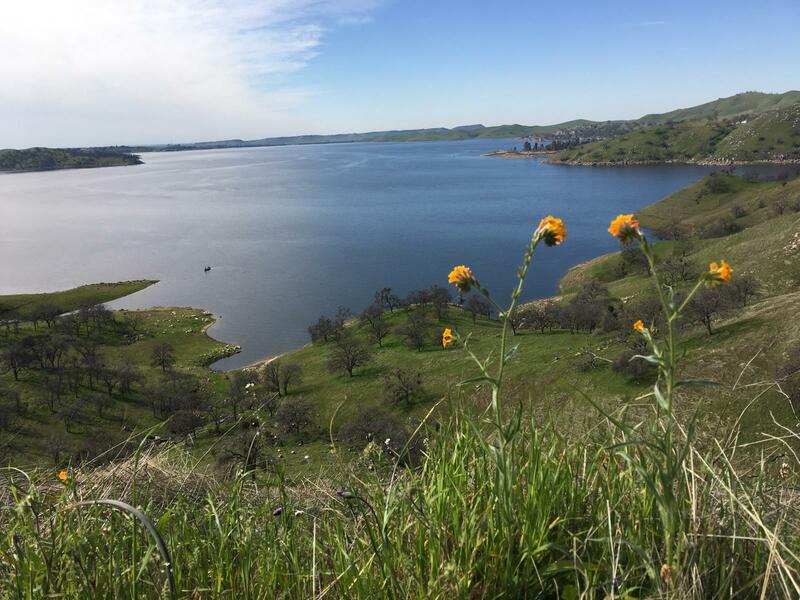 To the naked eye Millerton Lake already looks plenty full. Reservoir managers are working to drop the level to accommodate spring runoff. Gehrke says the only problem the new technology poses is how expensive it is to operate. He says it can cost three times as much as the amount it costs for the manual survey. There's about 10,000 cubic feet of water pouring out of Friant Dam a second. The other benefit from the aerial surveys is precise knowledge about potential flooding. That’s important to water managers like Michael Jackson who oversees Friant Dam for the Bureau of Reclamation. 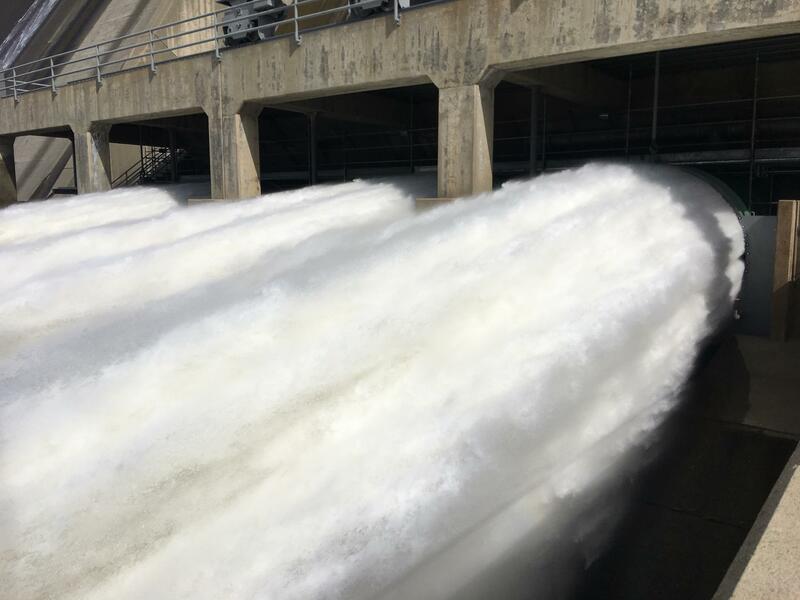 As we look at water spewing from the dam he says he expects more than 4 million acre feet to flow out of Friant Dam and down the San Joaquin River this spring. The reservoir only holds about 520,000 acre feet. 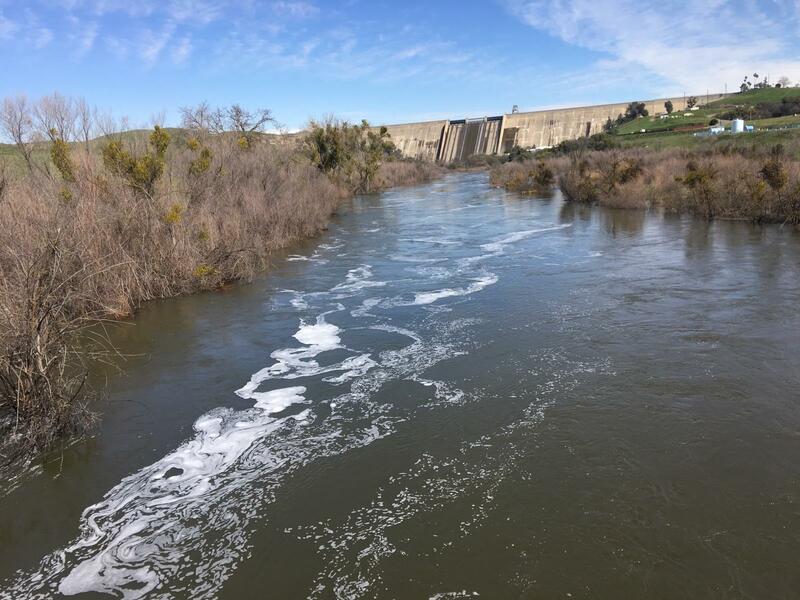 The majority of the extra water is flowing out of Friant Dam and down the San Joaquin River. "We’ll probably end up needing to draw it down to below 300,000 acre feet in order to make room for what’s shaping up to be a record snowpack and runoff year,” Jackson says. For Jackson knowing exactly how much water will flow into Millerton Lake northeast of Fresno is super important to protecting homes, farms and levees from flooding. As the new data continues to come in, the old way of snow surveying won’t totally go away. For at least the coming years water leaders will compare the data from the two methods to see if there are any inaccuracies. The Sierra Nevada snowpack is so big this year that water managers are worried that one warm storm or a couple warm days could inundate reservoirs in the region. FM89’s Ezra David Romero reports from Friant Dam. The federal Bureau of Reclamation announced Tuesday how much water water districts across California should expect to receive this year. Eastside growers in the Friant Division within Fresno County should receive a 100 percent allocation. Ryan Jacobsen is the CEO of the Fresno County Farm Bureau. There are over 1,400 dams and water diversion structures throughout California. Most of the time, we don’t pay much attention to them – they do their job and fade into the background. But months of massive storms after years of drought have suddenly brought the state of our dams and reservoirs to the top of the public agenda. Let's face it. America loves giant sequoia trees. Native Americans believe they hold spiritual value, early settlers tried to exploit the trees and today the trees adorn the National Park Service's badge. In a new book called "King Sequoia: The Tree That Inspired a Nation, Created Our National Park System, and Changed the Way We Think about Nature" author William C. Tweed weaves together a narrative of human contact with the big trees. He outlines who tried to exploit them and eventually what it took to protect them.